Combine the best of Portugal and Spain in one tour! Visit the most important cities in Portugal and the most historic cities of Andalusia. From the Spanish capital of Madrid, be amazed by cities like Porto, Lisbon, and Fatima! On the way back to Spain, do not miss the chance to witness the hidden gems of Andalusia and more! Departure from a central location in Madrid at 8.30 a.m. to Ávila. A city that preserves its medieval wall. Short stop. Then to Salamanca. Free time in this University City World Heritage. Departure to the Portuguese border until you reach Porto. Accommodation. Breakfast. Panoramic sightseeing tour of Porto considered World Heritage city. In the afternoon, optional visit to a famous winery with tasting of its world-famous “port wine”. Accommodation. Breakfast. Departure to Coimbra. City seat of one of the oldest universities in Europe and the birthplace of Fado. Free time. Then to Fatima. Center of the Christian Faith and World Pilgrimage Sanctuary with its impressive Basilica and the Cova da Iria place where the Virgin Mary appeared. Accommodation. Breakfast. Departure to the Batalha Monastery considered a World Heritage place by UNESCO. Continue to the picturesque fishing town of Nazare. Free time and continue to Alcobaça (World Heritage) and then to Lisbon. Accommodation. Optional night tour to attend a show of Fado. Breakfast. Morning sightseeing tour of the ancient Olissipo, drive through its main squares and avenues, Belem Tower, Jeronimos Monastery, Coach Museum, Monument to the Discoverers, Marquis of Pombal Square, Liberty Avenue. Free afternoon to catch the nostalgic corners of Alfama Quarter where Fado sounds like a missing past. Accommodation at the hotel. Breakfast. Departure at 07:30 hrs to Cáceres considered as World Heritage place because of the city’s blend of Roman, Islamic, Northern Gothic and Italian Renaissance architecture. Afterwards, continue on towards Córdoba, once the capital of the Caliphate. Dinner and accommodation at the hotel. Breakfast. An impressive tour of its Mosque and other sites of the Jewish Quarter. In the afternoon, after a short two hours ride reach Sevilla. Dinner and accommodation at the hotel. Breakfast. Morning panoramic city tour visiting: the exterior of the Cathedral, Santa Cruz quarter, Maria Luisa Park and Plaza de España. Free afternoon to discover exclusive views, specific flavours of this active full of the light city. Dinner and accommodation at the hotel. Optional Flamenco tour. After breakfast at the hotel drive south passing typical villages. Reach Ronda; free time to admire this town of Celtic origin and the marvellous view of the valley and mountain range. In the afternoon continue on to the Costa del Sol. Dinner and accommodation at the hotel. Breakfast. Departure towards the city of Granada. 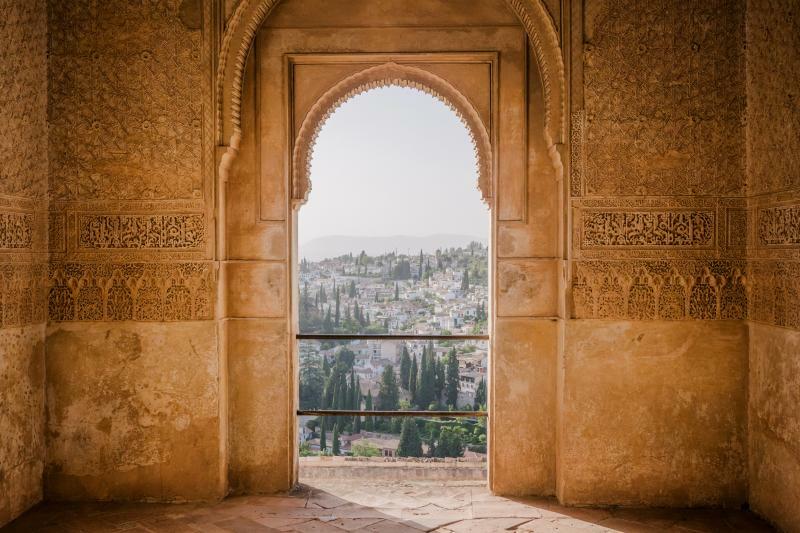 Visit the world-famous Alhambra complex and Generalife Gardens that have inspired several authors with its sound and sights, such as the “Tales of the Alhambra” by W. Irving. Dinner and accommodation. Optional Gipsy Flamenco show at Sacromonte quarter. Breakfast. Drive toward the sky of Castilla and surrounded by the Tagus river, the impressive Imperial city of Toledo –World Heritage City. Short guided tour of this historical old town. Then proceed with a visit to a famous “Damasquinado” (gold and silver inlaying in iron) factory. Continue o Madrid. End of services.